A fresh and silky red rose petal perfume. The top notes are very fresh and effervescent bergamot and tangy blackberry which dissolve into a heart of pure rose essences. This perfume is composed of 97% botanical ingredients like Bulgarian rose otto, Turkish and Moroccan rose absolute, Indian sandalwood, rosewood, vetiver from Haiti, and Sicilian bergamot. 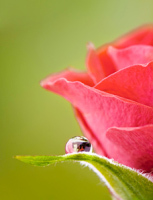 Rose otto harmonizes and balances the emotions and enhances romantic feelings. Sandalwood has a calming effect on the spirit and centers the energies. Bergamot aids in uplifting the soul and bringing joy and lightness. Additional notes include green leaves, orris butter and geranium. 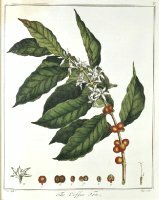 After the first rainstorm in Spring, coffee plants burst into a white cloud of star-shaped white blossoms. The fragrance is ethereal, like jasmine and gardenia, but with a touch of sweet caramel. Coffee Flower Eau de Parfum is a warm, sweet fragrance primarily based on the amazing scent of blossoms of the coffee plant. Rich cardamom, expresso coffee beans and Himalayan cedarwood grace the top notes, and a sweet base of Madagascar vanilla and French cognac give the fragrance a gorgeous patina. Update: Coffee Flower is now called Havana. Also nice to see Ava Luxe's full fragrance site back up (maybe it's been awhile) — I'm glad I got a lot of samples from her when I still could, however. Oh gosh, I just looked at Artemisia's prices! I was gonna say 17 and 35 ml bottles are cute and I was very interested until… I saw the price. And I am not a cheap person – but 17 ml of EAU DE PERFUME – 95 bucks? That's just crazy. Good lord. I sincerely hope that's a typo! “Rich cardamom, expresso beans and Himalayan cedarwood grace the top notes….” And then that typo, representing a complete lack of awareness and actual knowledge of coffee, sours in your gut, rendering this fragrance like a cheap, ill-named Plymouth Neon of fragrances. It's not at all unusual for an all-natural perfume, in fact, it's cheaper than some other all-natural brands I can think of. But yeah, it's out of my price range. I would guess it's a typo. Sorry, it is a bad one, let's just say “coffee” beans. I know this fragrance is pricey, but the coffee flower absolute I used is over $400 per ounce. The scent of the coffee flower absolute is too beautiful, I had to have it. I do offer samples, and if you mention this note, I'll give a $5 refund on the Coffee Flower sample. I'll offer this until 10/9/2008. So try it and tell me what you think.